Pictures from the next episode of The Big Bang Theory, "The Leftover Thermalization", have been added to our episode guide. 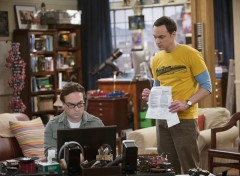 In the episode, tensions rise between Leonard and Sheldon when Leonard is overlooked in an article discussing the paper they co-authored together. When the electricity goes down at Mrs. Wolowitz's house, the gang salvage the defrosting food by throwing a final family dinner in her honor. Check out the thumbnails below and head over to our gallery to view the whole album. Following this episode, The Big Bang Theory will be off air for two weeks as CBS airs NCAA Basketball. The next original episode will air Thursday, April 2. We have added pictures from tonight's new episode of The Big Bang Theory, "The Positive Negative Reaction", to our gallery. In the episode, the gang celebrates the news that Bernadette is pregnant with a round of karaoke. Meanwhile, Bernadette is concerned when Howard freaks out about the pregnancy after realizing he must make more money to take care of a family. We have added pictures from this week's episode of The Big Bang Theory, "The Valentino Submergence", to our gallery. In the episode, Sheldon and Amy host a live special Valentine's Day episode of Fun with Flags, Leonard and Penny struggle with getting older, Howard and Bernadette find something unexpected in their hot tub, and Raj feels torn between Emily and the girl he met at the comic book store.